The challenge, then, is to not only deliver temperature-controlled medications, but to do so in an environmentally friendly way. That’s why we are proud to announce that OptumRx has introduced sustainable packaging for our home delivery service. The new, cotton-based packaging material has eliminated the use of polystyrene in our home delivery facilities while keeping drugs at a safe temperature. By the end of 2018, all packaging used in OptumRx home delivery pharmacies, BriovaRx specialty pharmacies and BriovaRx infusion pharmacies, will be recyclable, a first for a large-scale pharmacy care services company. Yet, packaging is only part of the story. 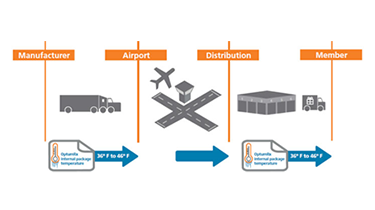 OptumRx has developed a strict temperature-controlled shipping and storage supply system to expedite and safeguard a drug’s journey from the drug manufacturer to OptumRx home delivery facilities to the member. Indeed, our logistical “cold chain” not only meets but exceeds industry standards. For the rest of the industry, 24 hours of protection is standard.3 But OptumRx packaging is designed to maintain a given temperature over a 35-hour shipping and delivery window, a full 45 percent improvement.4 Our extended standard takes into account the time drugs spend waiting on loading docks and other delays, which the shorter 24 hour standard does not. In addition to time, the other critical variable is temperature. Accordingly, specialty medication shipping boxes need to be engineered to exacting specifications. Both drug manufacturers and the US Food and Drug Administration will define the correct shipping and storage temperature for a given drug. For example, with many medications, both high AND low temperatures matter.5 Just as high temperatures can damage a medication’s potency, a medication that is inadvertently frozen may lose efficacy. Finally, not only do the boxes need to keep a medicine within a strict temperature range for an extended period of time but they also need to physically protect the medicine from damage. Finding an environmentally-friendly substitute capable of meeting the rigid standards of OptumRx was not easy. OptumRx packaging engineers worked with several external companies to develop new packaging materials which could match our benchmarks. After rigorous testing and performance evaluations, the engineers opted for a cotton-based insulation which is biodegradable, compostable as well as reusable in everything from pet beds to weed barriers. Since launching, the new packaging has been used to deliver nearly 1 million prescriptions. OptumRx expects to fill 2 million prescriptions with the new packaging by the end of 2018. 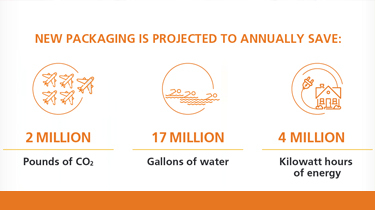 We estimate that switching to the new packaging will save 1.84 million pounds of CO2 emissions. Looking forward, we expect this packaging to pay even greater dividends as the use of temperature-sensitive biologic drugs expands, putting even greater demands on the cold chain. The health of the environment plays an important role in the health of every community. OptumRx is committed to minimizing our impact on the environment through responsible business operations and creating a company culture that heightens our employees’ awareness of the importance of preserving the environment and conserving energy and natural resources. 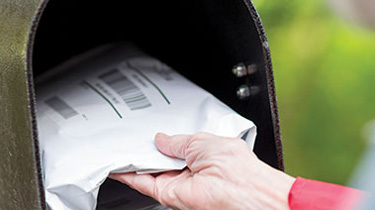 Contact your consultant or OptumRx representative to learn more about OptumRx home delivery and our environmentally friendly packaging.